Hey, everyone, and welcome to this week’s Deep Sea Dispatch. This is a very special post in honor of the Discovery Channel’s Shark Week (now in its 30th year)! So in proper fashion I am sitting here in front of my TV with a big bowl of shark gummies and I’m going to tell you about my top-four favorite sharks ones you won’t find around Cape Cod! I’m not David Attenborough, so I’m not going to get too scientific about this and this scale is going to be completely arbitrary. Let’s get started! 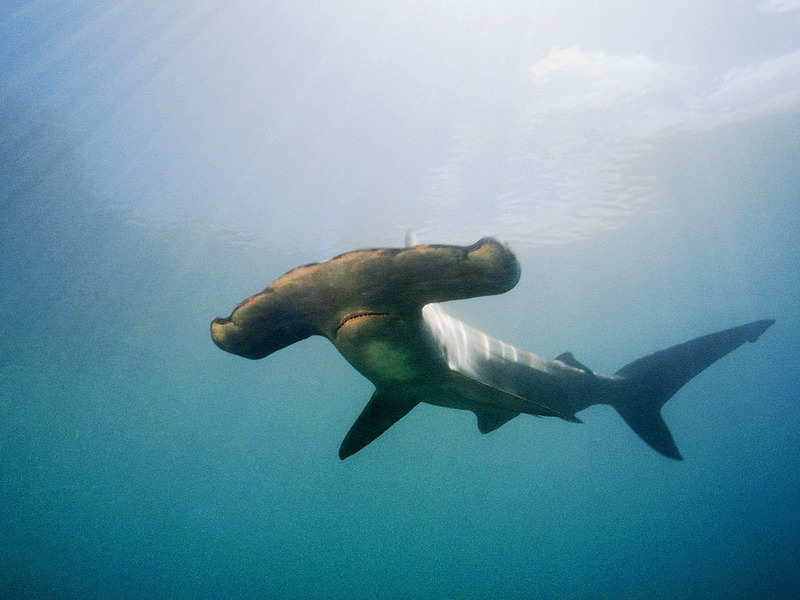 Coming in at number four we have the hammerhead shark. 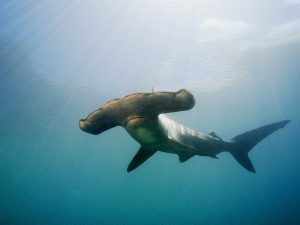 Everyone loves the hammerhead shark, it’s one of the first ones you learn about as a kid because the head shape is so distinctive. I can always identify these guys, no problem. I don’t know why their heads are shaped the way they are and scientists don’t have a set reason either (although there are plenty of theories). But the cool thing about Provincetown is that we accept everyone, even if you have a hammer-shaped head. If these guys could keep their teeth to themselves, I’m sure they would be welcome here. 9/10 belong in Provincetown. 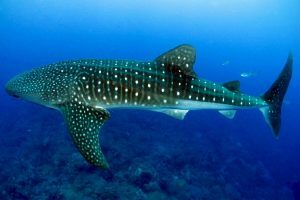 For number three, we have the gentle giants of the shark world: the whale shark. They are the largest living sharks and eat the smallest ocean animals: microscopic plankton. Much like the whales they’re named after, whale sharks are filter feeders and don’t have any teeth at all. These guys are sweet and cute and they get bonus points for having such lovely spots. 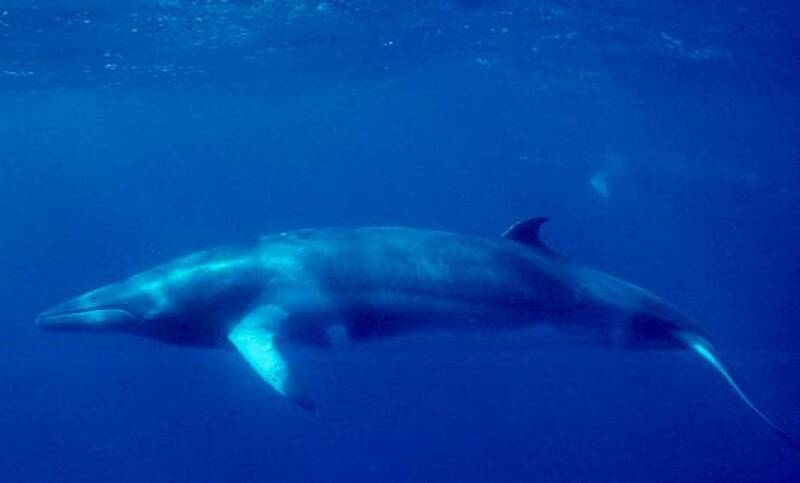 These are the snazzy dressers of the ocean. 11/10 belong in Provincetown. 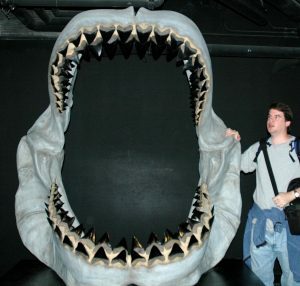 Pictured above is a reconstructed jaw of the Megalodon sharks that cruised the oceans 2.3 million years ago. They were the largest sharks to ever exist and, judging by this picture, could absolutely swallow you whole. Thankfully no one is going to encounter these fellows except on the big screen in classics such as Jurassic Shark, Mega Shark Versus Crocosaurus, and the upcoming The Meg. (What more could you want in a movie? It’s got Jason Statham, giant sharks, and a cute puppy wearing a bow!) These guys are really cool so they get some points, but absolutely terrifying so they lose most of them. 3/10 belong in Provincetown. My all-time absolutely favorite shark can’t be introduced with a picture. You need a video to truly appreciate the awesome alien-ness of these creatures. Seriously watch the video right now. I’ll wait. 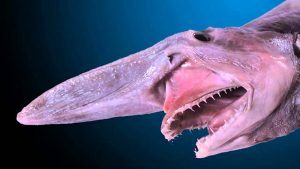 There are lots of reasons why these sharks are so freaky-looking–the totally black eyes; the elongated snout; the super thin, super sharp teeth–but the most impressive one of all is the distensible jaw. Just look at that thing in action. 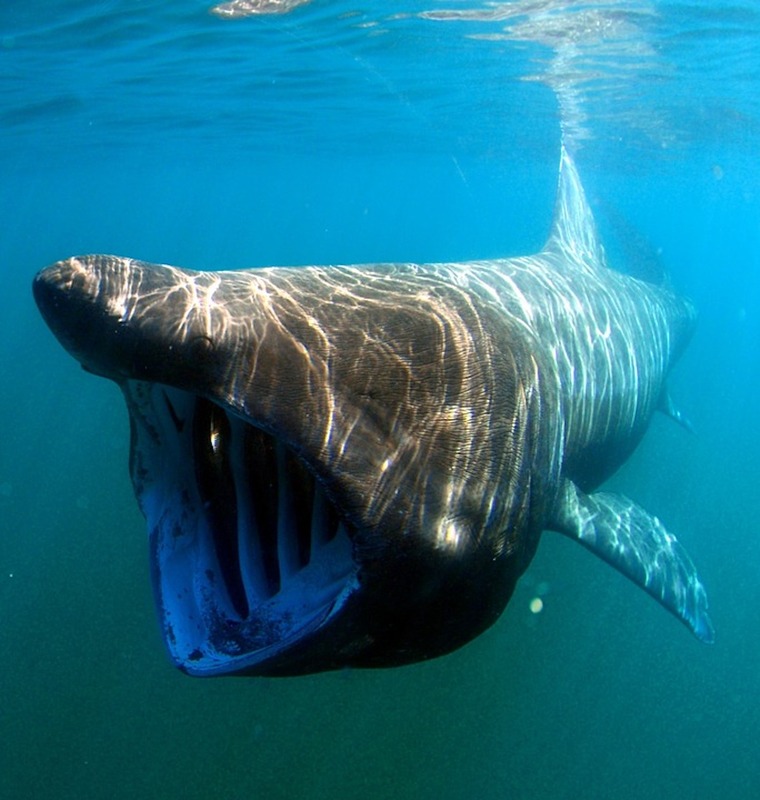 There is nothing quite like an animal that can just throw its jaw out to bite you and that scary/awesome fact is why these are my all-time favorite sharks. 5/10 belong in Provincetown.